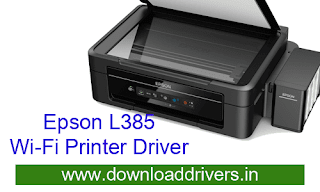 Download Epson L385 printer driver : Epson L385 multifunction drivers for your operating system from here. Epson L385 has a warranty of One year or 30000 pages (Whichever come first). The l385 is a good multifunction printer with WiFi connectivity. Which gives us efficient printing at very low printing cost. From here you could download L385 Epson printer driver for Windows XP, Win7, Win8.1, Windows 10, MAC and Linux. 2 Responses to "Epson L385 Wifi All in One Printer driver and Scanner software download "